NES Double Dare (USA) in 06:26.48 by goofydylan8. Double Dare is closely based on an old Nickelodeon children's game show. To win, each team must answer a few of the trivia questions before time runs out. If the team answering thinks the other team might not know the answer, they can "dare" the other team to answer the question for double the points. 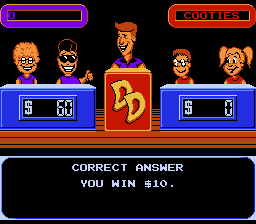 However, the other team has the option to "double dare" them right back for a chance to win quadruple the points. The winning team gets to race through the Double Dare obstacle course, which features obstacles like the 1-Ton Human Hamster Wheel and a tank of Nickelodeon's iconic green slime. Thanks to tools and the low difficulty of the questions, the author, goofydylan8, doesn't have to dare the other team even once to win.